As any cat owner will know, you push a cat too far and it will turn very quickly. And when it does, the claws come out, the teeth lock onto your arm, and suddenly you're consumed by a feline viciousness. Basically, don't aggravate a cat unless you want what's coming to you. The people in this video found that out the hard way and frankly many of them should know better so it's hard to feel sympathy when the cat lashes out. It's also hard to feel sympathy because Street Fighter II visuals and sound FX have been added over the top to makes things extra amusing. 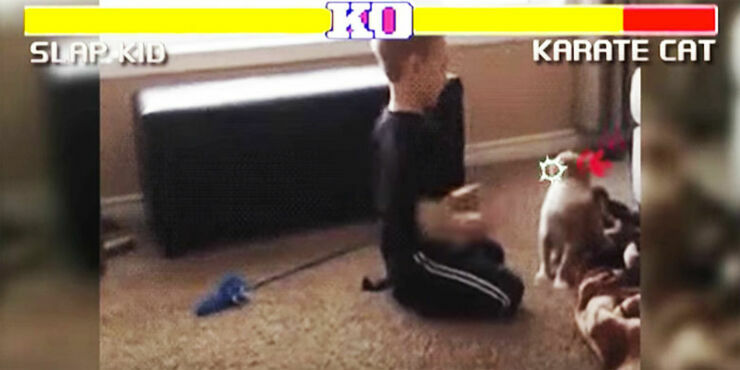 Whether it's a cat versus a toaster (toaster wins) or a cat versus Slap Kid or cat versus cat, by adding in a Street Fighter II power bar and voiceover, it makes things infinitely funnier. Let this video be a lesson to all of us—unless you want to see your cat's fighting side, don't annoy it. Ever. Certainly don't slap it in the face, or it will own you. This is the second 'Street Fight: Cats Edition' from YouTube channel Marca Blanca who is shortly giving up making these type of videos ("Marca, please do not stop"), so this might be the last one he makes). You can check out the first one here.